I built an IBM Watson chatbot during the four weeks I spent with KnowNow Information. From scratch… Everything! Want to know how? My name is Solly Welch. Today is my last day at KnowNow and safe to say, I am leaving with a lot more knowledge and understanding of IBM’s Watson, Cloud Functions and IoT than I did when I started. The main projects I have worked on are adding human-like interactions and functions to the Consentua chatbot, The local government landing page Chatbot as well as a chatbot for a council’s accounts team. I also managed to build a few chatbots from scratch including the Entelligently FAQ chatbot and also Entelligently‘s Comfort Bot. 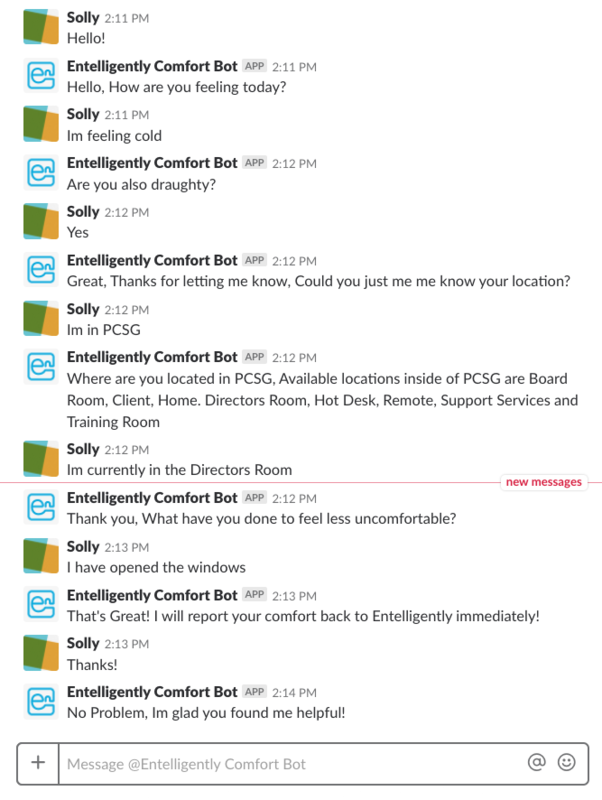 The Entelligently Comfort Bot has been my main project and definitely my favourite. This project is almost complete and the plan is to deploy across many locations in the future. This bot is designed to collect users comfort levels and store them as variables. It later sends these variables to Entelligently. The bot works the same way as Entelligently’s app and website, however, the chatbot interface is presented in a conversational format allowing more flexible answers. It also allows users to talk to the bot as If it was a human. This helps the user express naturally how they feel. Another project I tried was IBM Watson’s Tone Analyser. 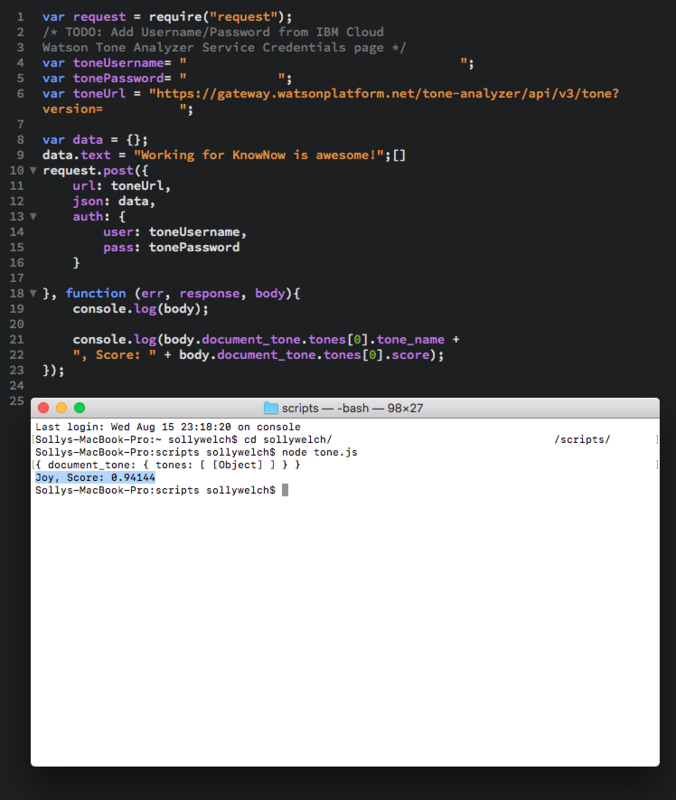 This was able to detect the tone that the user was typing in and then determine appropriate answers. For example, the sentence “Working for KnowNow is awesome”, Watson would return saying its 94.144% positive that the tone of the message is Joy! In the future, this can be incredibly powerful in understanding how users and people really feel when speaking to your chatbot. As well as why the chatbot selects its responses. I look forward to experiment with this further! Another IBM Service I used was the Language Translator. This enables translation from one language to another in real time. I was very lucky to have Fatima and Tiziana in the office who both speak Italian fluently so we were all able to put the language translator to the test and see exactly how accurate it was. We were very surprised with its accuracy and its ability to understand tenses. This would be useful to deploy in a Chatbot that is available around the world. It was difficult to set up both the language translator and tone analyser at first but once setup It was very simple to use and manipulate. When I started four weeks ago, I had a very weak understanding of IBM’s Cloud Services. However, four weeks on I feel confident and I cannot wait to put everything I learnt into practice and continue creating cool chatbots and use IBM’s Cloud Functions. I really enjoyed working with everyone and learning from people who are more experienced than I am. My favourite part of these four weeks was problem-solving. When things didn’t go the way I wanted I enjoyed working out effective, long-term solutions. Lastly, I would like to thank Chris, David and everyone else in the KnowNow team for helping me learn and understand more about IBM’s Cloud and the Watson chatbot. I can’t wait to come back soon and learn even more and expand my knowledge. If you want to know more about IBM Cloud services or to talk to someone about getting your own Watson chatbot then send an email to contact@kn-i.com.